Being a spectator of dawn and dusk is truly magical; add to it, a dip in the blue waters just as clear and reflective of the sky above which only gets better with the silence and intermittent gushing of the wind. The experience of it all fused as one is incredible, such that it teleported me to a state of mind that could only be described as a vacation while at work, and the occurrence of that is truly rare. Acting is my first love and travelling comes a close second by a mere difference of an inch. The chance to see the unseen and delve into the unexplored makes both acting and travelling exciting. Thailand, to me, had previously meant shooting in Bangkok, but this visit further opened up and changed my opinion of the country as I explored it; As far as life defining experiences go - the mesmerising sunsets of Krabi makes the top of my list. How is one to resist the beautiful hues of blue, pink, purple, yellows and oranges that the sky makes possible each day? In Krabi, the day rushes past us really quick with a session at the most luxurious spas, leaving you boneless and relaxed akin to a jelly. This was followed by scrumptious food, every meal in Krabi was unique not only because of the way in which the cuisine was interpreted, but also because there were many to choose from – Apart from Thai - Indian and Italian cuisines, biased by my love for the same, seemed to be the next best cuisines I tried. I was also in love the sweet fresh coconut water, which became a staple while there, almost to a point of addiction. The cities come alive in an intriguing way once the orange hues of the sunsets give way to the darker blue of the night. The nightlife in the market of Ao Nang is a must, there is a variety of local goods, souvenirs, tattoo artists and massages. Restaurants and bars up their ante with some having live performers who give you an understanding of their culture, of their roots and also their being with the performances; and you can never go wrong roaming the relaxed yet busy streets which give you a true sense of what vibe Krabi stands for. Thankfully, due to a shoot we were able to explore the non-touristy yet beautiful parts of the island, those hideaways that are scenic but inaccessible unless looked for, there’s almost a sense of achievement when you chance upon these untouched pieces of nature. The spooky caves are eerie but strangely beautiful with their natural formations and patterns, the waters far and wide aided my lookout for a rising or setting sun, my eyes trained on the horizon. 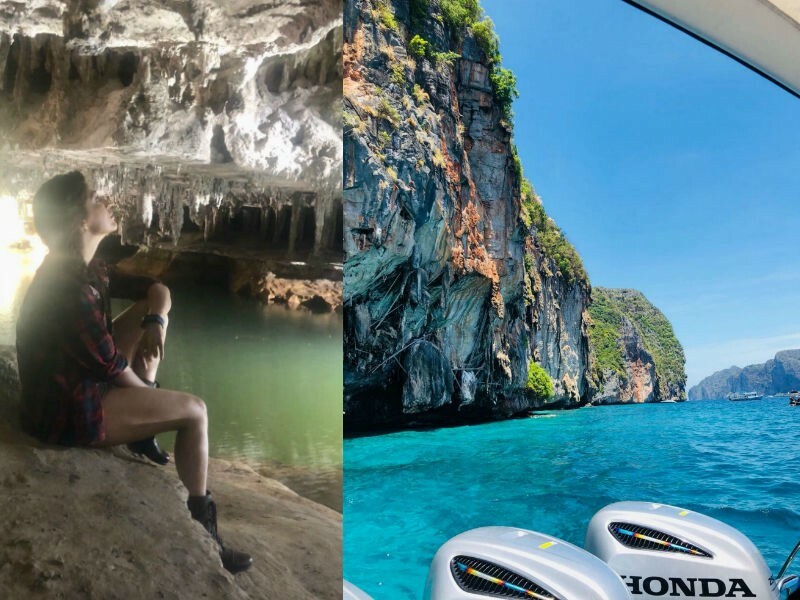 In the best sense, Krabi seemed like the perfect choice for a mini vacation in the middle of work, I was blown away by this new side that I got to see. It only goes to show that all we need to do is travel farther to unravel more. Thailand, more so Krabi, will now in my mind be recorded as stunning mixture of nature, peace, nightlife, culture and endless waters.